A friend of mine once said to me that Amethyst was her favorite character out of anything she’d ever seen. I really wondered why and I’ve thought about that off and on since she told me a few months ago. We hardly see Amethyst outside of comic relief; how could that character be so impactful for you to claim her as your favorite ever? 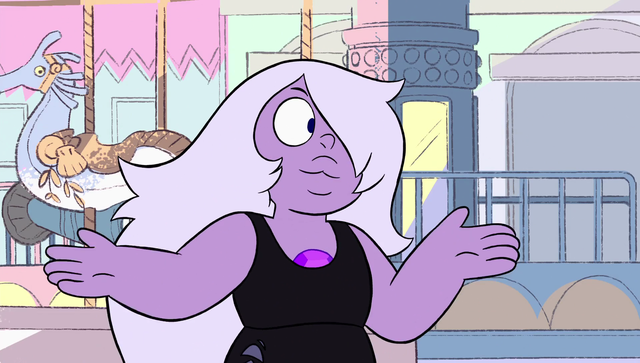 After watching “Steven vs. Amethyst” and being blown away by the utter realness of her character, I went back and watched all of Amethyst’s major episodes and tried to figure out if there was something remarkable I was missing about the least notable Crystal Gem before. Amethyst is fun loving and aloof, always doing something physically goofy either with slapstick based comedy or shapeshifting. While the majority of her episode appearances have her one dimensionally be the fun trouble maker, she is suffering. She has suffered and clearly continues to outside of the spotlight. Carrying the burden of an existence she didn’t ask for, made from the destruction of the Earth that the Crystal Gems came to protect. Pearl outright damns the Kindergarten in “On the Run,” making Amethyst conclude that Pearl is damning her existence along with it. The majority, if not all, of Amethyst’s conflicts within the series stem from the idea of not being enough. Strong enough, good enough, that who she is as she is is simply not what others want. She was made in the Kindergarten, so she’s not good enough to be in the Crystal Gems with the other homeworld made gems. Greg won’t stay and watch Lil’ Butler with her, so she’s not good enough as herself and needs to become someone else through shapeshifting. Garnet gets on her case about her regenerations, Pearl and Garnet fuse because Sugilite is too destructive, Peridot remarks that she’s defective. She’s not enough she’s not enough she’s not enough. Amethyst has seemingly constant voices telling her that she is not good enough, and that causes a lot of self loathing and self doubt. On really bad days, the words “I hate myself” are flung around along with various pieces of the scenery. “I’m not going to let you stand there and remind me of everything I hate about myself!” she says in “On the Run,” earlier referring to herself as a parasite. On bad days, she seems to have no sense of identity, who she is or what traits she has other that negative ones. For example, the main plot thread in “Reformed” is that Steven is trying to get Amethyst to answer the questions to a Crying Breakfast Friends personality quiz but Amethyst either avoids the questions or gets angry at them, claiming Steven is trying to psychoanalyze her. In “Onion Friend” she describes her friendship with Vidalia: “I was just like, a dumb sponge following you around.” The only positive, consistent validation that she possesses good within her came Rose, “Rose said I’m perfect the way I am!” she said in “Crack the Whip”. Obviously, Rose isn’t here anymore. Steven is. And as that is a point of contention with Pearl, it is with Amethyst as well, though in a different way. The back half of “Steven vs. Amethyst” is a fight between the titular characters over who is the worst, weakest Crystal Gem. While Steven is the rookie to the team, he is slowly becoming more and more capable and experienced, leading Amethyst to feel like she’s falling back into her old role as the weakest before Steve came along, despite her advantage of experience. 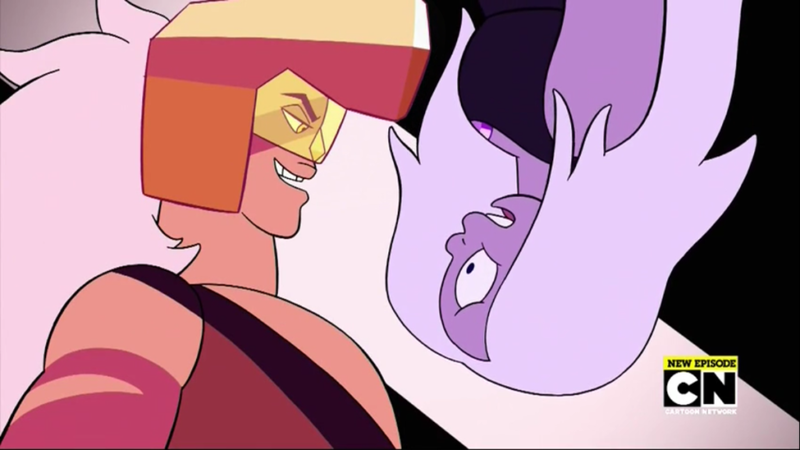 And she no longer has Rose in an authoritarian role telling her that she’s perfect as she is; instead she has Steven’s actions telling her that she is unneeded, yet again who she is isn’t enough. I wrote a few weeks ago about how I was glad that the complex, messy relationship between Greg and Pearl could and does exist in this show on a network aimed for children, how more complex stories are being shown all across the board. While Amethyst’s character presents as simple on the surface, I think it belongs within that label of complexity. I can relate a lot to Amethyst; I have similar constant feelings of not being enough, lack of solid identity, etc. And while those points of similarity between us make me want to react in a coddling manner, want to adopt a mentality that she can do no wrong, I try to recognize that she is just as flawed as I am. She gets physically destructive when she’s hurt, just like I do. She shape shifts into Rose to hurt Greg, I lash out in similar “if I was this person you’d stay” ways to hurt my friends. I can’t help but applaud an 11 minute television show about aliens of all things for displaying this reality of complicated imperfection, chronic insecurity. I’ve been thinking a lot about the language Steven Universe has been pushing about how gems are made for an expressed purpose. They are made to be perfect at what they do. Amethyst is not. Amethyst is not perfect in her function or mentally. No one on Steven Universe is perfect. No one in any show, book, video game, what have you, is perfect. No one on Earth is perfect. But does the impossibility of perfection mean that we don’t get to be happy? Should we strive for perfection or happiness? Do we need to be perfect in order to be happy or is it that if we are happy then we are as perfect as we can be? Amethyst has been thinking the former. If she is perfect, then she will be happy. There will be no more self doubt, anguish, she will be exactly who she needs to be and thus all of the feelings of not being enough will disappear. But it’s just not feasible. And she’s been stuck on that. My friend expressed similar sentiments. 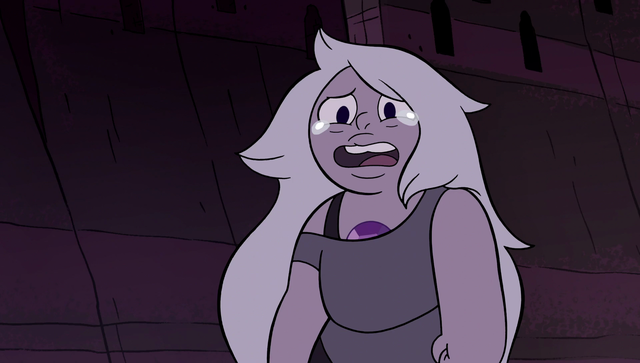 What Amethyst is going through, no matter how little screen time, she goes through too. As do I. As do probably all of us to some extent. 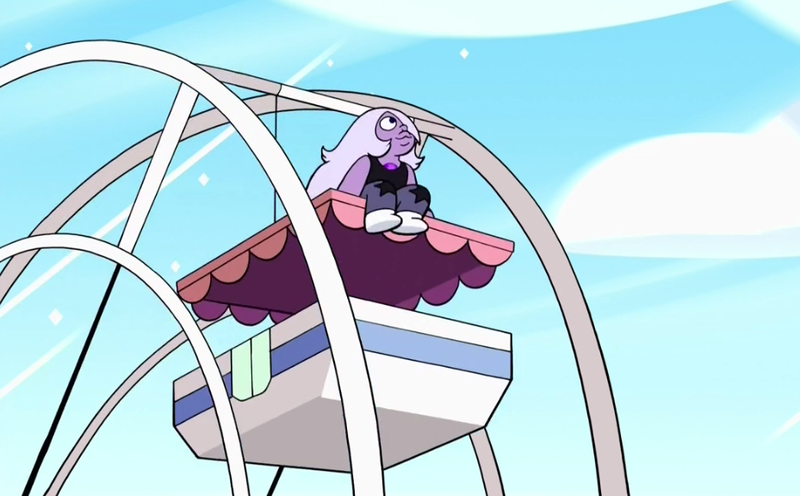 I think it’s about time to pay more attention and see where Amethyst is going to go from here. She is…human. Despite not actually being human. The deep intricacies of human emotion, the bluntness as well, Amethyst goes through to more of an extent that I think Garnet or Pearl do. I have no doubt she’ll be knocked back down again into the hole of self doubt; thinking that someone’s internal struggles magically go away after one conversation/fight is unrealistic. It takes time to deal with that stuff. And I’ll be rooting for her. I like your breakdown of her arc, this pretty much covers everything. I wouldn’t say she’s my favorite but she’s very high on my list. Higher than most people’s I’d imagine. I think it’s actually a similar problem some people have with the humans have, it’s just not as fantastical and it’s a contrast to the other struggles the CG’s face personally. I think the biggest thing I agree with here, is that Amethyst is probably the most “human” in terms of the range and intricacies of emotions she feels and why she feels them. It’s not like it’s a huge difference between her and Garnet/Pearl but it’s something that’s been noticeable for me. Not necessarily human as in relatable, but in that her feelings come from a less metaphorical place than Pearl and Garnet. Both their stuff being more heavily tied to Homeworld, so there’s a higher level of speculation, fantasy, and imagining that we have to go through. With Amethyst it’s more about her direct relationships to the CG’s and her place on the team. Human relationships. Even with her being small and ‘overcooked’, it’s not as metaphorical. She was supposed to be a certain size, and isn’t. 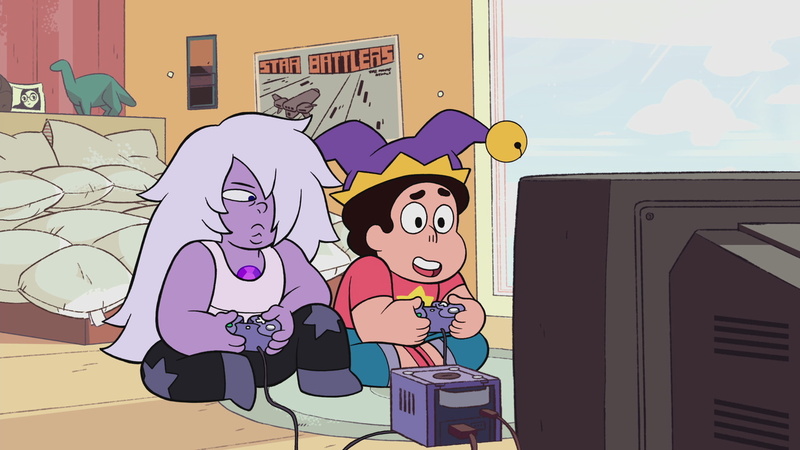 Two groups in my head for the CG’s were always Amethyst-Steven and Pearl-Garnet. It was always hard for me to pin down why though, beyond her being small and young. So I like reading other people’s opinions on it. I think that might’ve been deliberate by the crew as well, she was made on Earth after all and didn’t live through the war. She doesn’t carry many of the hangups associated with Homeworld that Garnet and Pearl do and her struggles aren’t as allegorical to me because of it. She even talks to and connects more with humans on her own than the other two, her relationship with Vidalia and Greg being standouts. Not to say that Pearl and Garnet’s storylines haven’t impacted me strongly or that we need direct storytelling for it to be more human, but I’m always aware that I’m viewing their stories as metaphors. As allegories for things we experience as humans on Earth. And I’ve almost never felt that way when we got Amethyst stuff, however little it was. Wow that was a great article, such a good writer but I also agree Amethyst may be the jokester but that’s because she’s displaying her insecurities with comedy. As we see often she strives for attention and people to laugh her jokes. She wants to feel validated and worthy.